Great for: Board meetings, sales kits and presentations, trade shows, conferences, public relations and press kits, employee trainings. Eprints are digital versions of reprints. Eprints are sold as time-based PDFs for use on internal and external company websites. With a shorter turnaround time than reprints, Eprints can maximize exposure to a large audience quickly and effectively. E-distribution is the licensing of a custom pdf for use in electronic newsletters and email blasts to a designated number of recipients. E-distribution pdfs can be purchased alone, or in addition to the Eprint. Great for: Increasing traffic to your company website, spreading news quickly and reducing your organization's carbon footprint. Our customized plaques and framed awards. 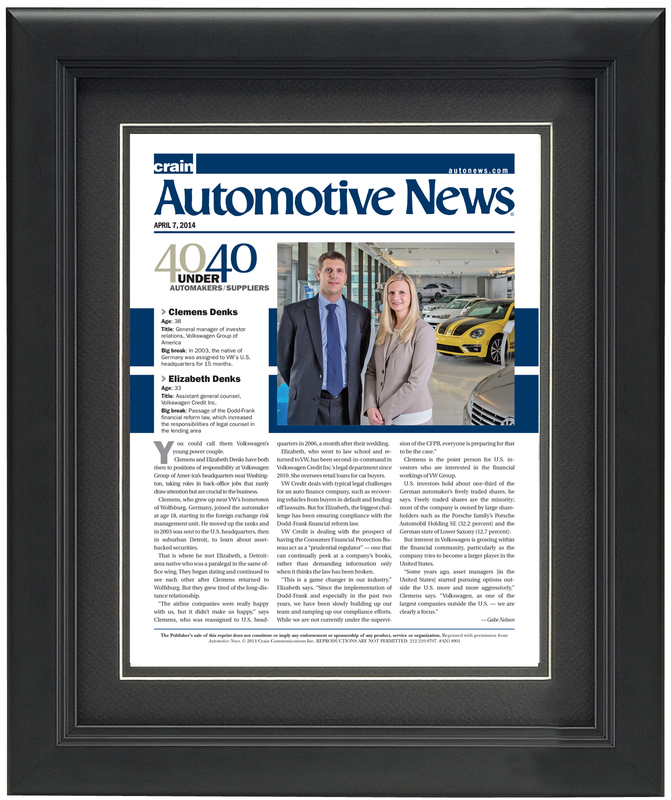 Celebrate and commemorate your accomplishment or feature in Automotive News. With a wide variety of color and finish options, you are sure to find a plaque or frame to fit your taste. Great for: Display in your company's reception area or personal office or present as a gift to the person featured. License the Automotive News logo, or special feature logo. Licenses are offered in 1-year terms and can be used for all print and digital marketing for that time frame. Great for: Use on your company website, in email signatures and in print materials such as advertising. Automotive News content is the property of Crain Communications Inc. and is protected by copyright and other intellectual property laws. You cannot reproduce, distribute, sell, publish, broadcast or circulate the content from our publication or website to anyone, including but not limited to others in the same organization, without the express prior consent of Crain Communications Inc. Permission can be obtained for re-use of articles or charts & graphs - in books, journals/magazines, newsletters, theses/dissertations, classroom materials/academic course packs, academic conference materials and training materials (including continuing education). Most permission requests carry a fee. Fees vary based on usage and content. If you are interested in multiple articles or products, contact Lauren Melesio at [email protected] to discuss our custom reprint opportunities and compilations. CAN I ORDER JUST ONE REPRINT? Our glossy, 8.5 x 11 reprints have a minimum quantity requirement of 100. 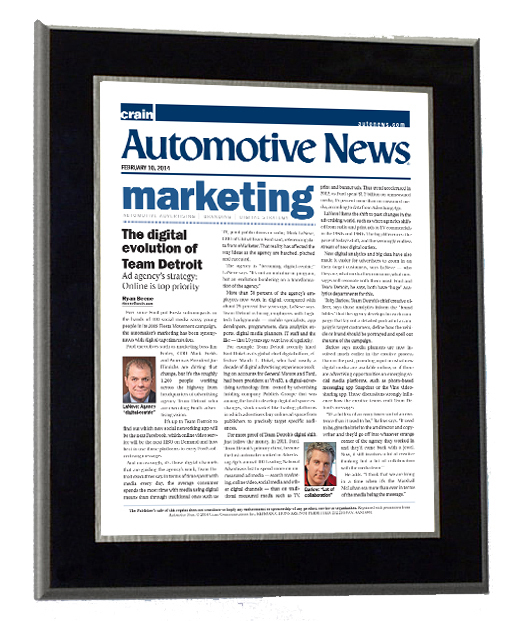 If you would like to commemorate or display your feature in Automotive News, one of our customized plaques would be a great option. Or, to order a copy of the issue in which the article appeared, please call 1-877-812-1581. WHAT IS THE STANDARD TURNAROUND TIME FOR REPRINT PRODUCTS? Standard turnaround time for reprints is approximately 10-12 business days from the date we receive your order until delivery. If you need reprints sooner than the standard timeframe, we offer a rush turnaround on all products at an additional fee. CAN I MAKE PHOTOCOPIES OF AN AUTOMOTIVE NEWS ARTICLE FOR AN EVENT OR FOR EDUCATIONAL PURPOSES? While photocopies do not possess the same professional look and feel of an article reprint, Automotive News does grant photocopy permission on a case by case basis under publication guidelines. Please contact Lauren Melesio at [email protected] for photocopy inquiries. DO I NEED PERMISSION TO LINK TO AN ARTICLE ON THE AUTOMOTIVE NEWS WEBSITE? Simply linking to an article on the website, without the direct usage of text, logos or photos from Automotive News, does not require a license or permissions agreement. However, the link may prompt the viewer to subscribe to www.autonews.com. For a more user-friendly experience for visitors of your website, we suggest an Eprint. CAN I PRINT COPIES FROM AN EPRINT? 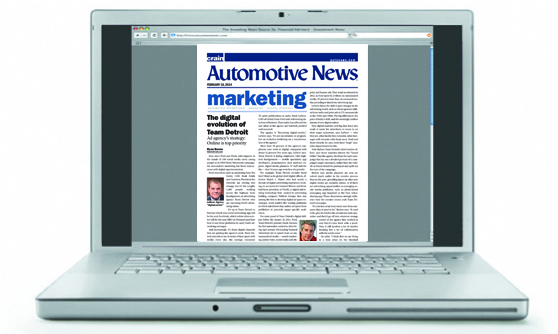 Automotive News does not permit the printing or editing of electronic products. If you are looking for physical copies of an article, please inquire about reprints.